Sony has cranked out a bunch of new lenses lately, and one of their latest got my attention: the FE 50mm f/1.8. It did so for a couple of reasons. 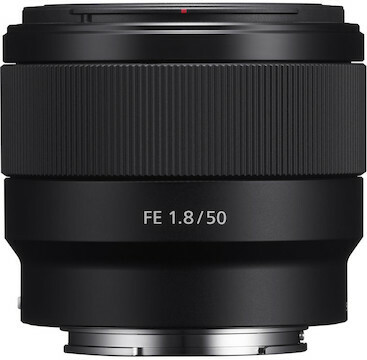 First, I wasn’t expecting it, since they already have the really good FE 55mm f/1.8 ZA lens in their lineup. Second, I’ll admit I expected them to suffer from the inevitable comparisons with Canon’s ‘nifty fifty’ the 50mm f/1.8 STM lens. The Canon lens is small, inexpensive, quite sharp, and has some of the lowest copy-to-copy variation we’ve ever tested. Copy-to-copy variation has been a weakness in the FE lineup. While Sony was clearly making progress with that I wasn’t sure they were ready to take on the reigning variance champion. The sony lens is a little larger and more expensive, but then again, if you shoot Sony FE you’re kind of used to ‘a bit more expensive’ lenses and at $250 this is a really affordable lens. 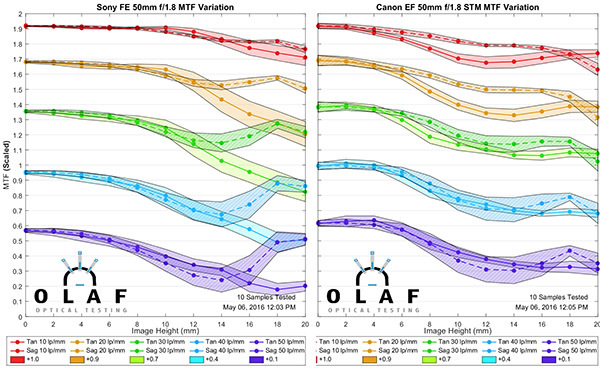 As always, I remind you that this isn’t a review of the lens, simply a lab test of multiple copies on our optical bench to assess MTF and variation. Well, we’ll go with the logical comparison first, the Canon 50mm f/1.8 vs the Sony 50mm f/1.8. 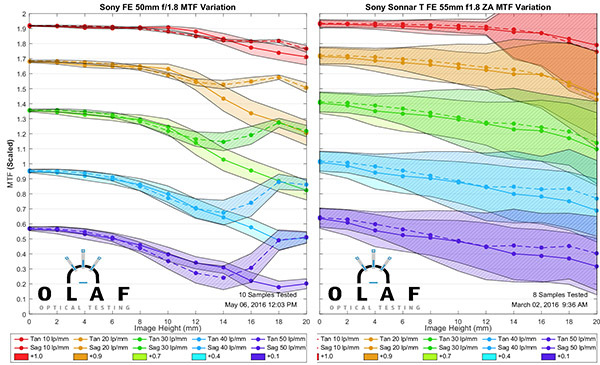 The Sony actually does better at the lower frequencies, indicating it’s probably a more ‘contrasty’ lens, while the Canon is better at higher frequencies, so it may have superior fine detail resolution. Both are really quite good, though, and I should really use ‘different’ rather than ‘better or worse’ to compare them. Of course, a lot of Sony shooters want to see the FE 50mm vs 55mm comparison. 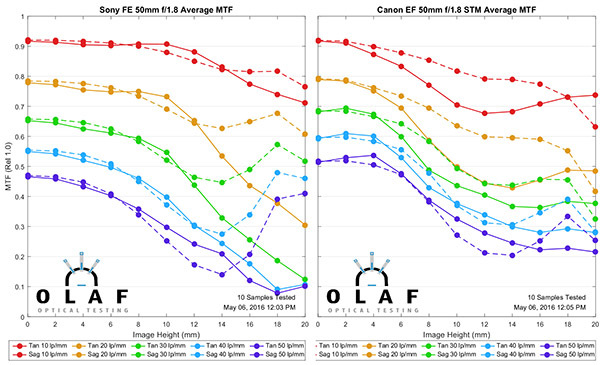 There’s quite a price difference and while there’s a lot more to a lens than MTF curves, people probably want to see what the MTF differences are. The 50mm is a very good lens and quite a bargain at the price. But there are reasons the 55mm costs more. It’s clearly better across the field than either of the ‘nifty-fifty’ lenses. But the usual rule of ‘increasing resolution is increasingly expensive’ does apply. You get a better lens, but you pay a lot more. This is the portion of the test where I just expected Sony to not compare very well. But guess what? The copy-to-copy variation on the FE 50mm f/1.8 is superbly low. Remember, the Canon 50mm f/1.8 STM is the standard against which all other lenses are measured. It’s amazingly consistent. The Sony is very close to that. In some ways (center sharpness variation) it’s actually a bit better. So hat’s off to Sony, they’ve made an FE lens that from a copy-to-copy variation standpoint is as good as anything on the market. To summarize, then, if you buy a 50mm f/1.8, chances are it’s going to be just about like every other 50mm f/1.8. Sure, there will be a few bad copies, there always are. But they’re very consistent. We’ll probably tear one of these down soon and take a look inside to see if we can determine just why sample variation is so low. The Sony is a ‘unit focus’ lens with no separate focusing element, if I read their release information correctly, which may have something to do with the lower sample variation. Do you know what are the main causes of lens variation ? Since I am going to get a Sony A7R II and due to the fact that I love my Zeiss lenses, I asked Zeiss if they could change the mount of my 135mm APO from ZF.2 to ZE. Since ZE lenses stay wide open on Sony cameras till the moment of exposure, achieving precise focus with a telephoto lens becomes easier so I wanted to change the mount of my 135mm APO from ZF.2 to ZE. In response, Zeiss told me that 135mm ZF.2 was totally different from ZE and changing the mount would not be possible. Since Sigma already offers this service for their lenses, I don’t think changing from mechanical aperture to electronic aperture is that difficult. What I infer from the answer I received from Zeiss is that difference between ZF.2 and ZE lenses are more than the aperture mechanism. I checked the DPR comparison tool and noticed that the Otus 85mm 1.4 was soft at the corner on the D810 whereas it’s sharp on the 5DSR. to my surprise, It is not even as sharp as the Nikon 85mm 1.8G so I have become curious to know how different ZF.2 and ZE lenses are. Since these lenses are super expensive and I just own Nikon cameras, It’s not possible for me to investigate it myself. 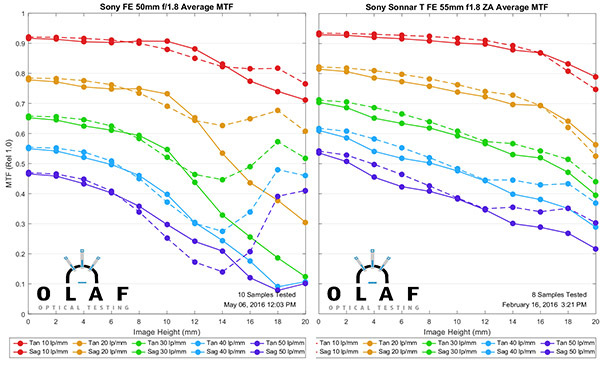 Have you ever compared ZF.2 lenses to their ZE counterparts with regard to image quality and sample variation? I know this comment is not related to the post but I didn’t know how to contact you and you are the only person whose investigation I trust. Thanks, Larry. I was tired when I read it, might not have had all my neurons engaged. I’ll do the second one first because I honestly don’t think that’s a generalization that can be made. There are some awesome crop sensor lenses and while I can’t just say they are better optically than the equivalent full frame, sometimes they are. And always they are smaller, lighter, cheaper. If I shot crop sensor I’d have some crop-sensor lenses in my bag, but depending on brand would probably have some FF lenses in there too. The DxO PP calculation is both bogus and brilliant. Brilliant in that it answers a demand from the people who want a simple scale that says better or worse. DxO’s math is always correct and they are way better at math than I am. Bogus in that any time someone won’t disclose their methods, it’s bogus. DxO doesn’t disclose what their formulas are. For examples, we don’t know how their testing method looks with a very astigmatic lens. We know they test circular dots on their chart, but is their original number an average of the circle, certain edges at certain locations, heck we don’t even know their testing distances. But mostly I don’t like generating massive numbers on limited testing. DxO, to me, measures the height of one third grader and says it’s 58.43567 inches, while a single 4th grader is 59.94352 inches, therefore 4th graders are 1.50776 better than 3rd graders on average. That’s an invalid conclusion and the numbers suggest it’s more scientific than it is. There have been too many examples where their results have been silly because they’ve had a bad copy, then quietly changed later after people have ridiculed them. The other problem is the weighting of the formula, and while they aren’t as secretive about that, their weight may have nothing to do with the way you shoot. Should their ‘blur scale’ be weighted at f/8 or wide open, or evenly about the range? Should it be weighted differently for various cameras because diffraction sharpening will occur at different apertures depending on pixel density? I have my thoughts and they have theirs, both are relevant. But their number is only for their thoughts. On the other hand, I think they are brilliant at testing cameras, which is what their background really is. And some of their specific lens subtests (not their overall number) are pretty useful.